Dare you discover the bottom-stabbing bike seat? Or test-drive the terrible toilet snorkel? From gruesome gadgets to murderous machines, shudder at these evil inventions! You might think scientists exist for the noble advancement of mankind. You might think they want to make people’s lives better! But in fact those sickening scientists have made some of the most awful gadgets you could ever imagine, from the atom bomb to the electric chair! That’s not so nice, is it? In fact, it’s really quite nasty. Your teacher probably won’t tell you these things in science class – but Horrible Science will! soooo funny i love this book and all it’s series! 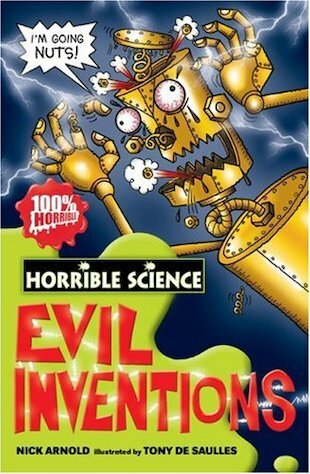 it’s a really fun way to learn about the worst and meanest inventions of all time. you don’t even have to like art, science or be good at either one of them to like this series. hope you like this book and i recommend all the other books in the series too!